Tim Peake’s spacesuit will form part of the National Space Centre’s new exhibition, opening this summer, which will hopefully inspire future scientists. Tim Peake’s spacesuit will feature within an exhibition at the National Space Centre in Leicester, where it will be displayed alongside garments worn by Apollo astronaut Buzz Aldrin, UK-born NASA astronaut Piers Sellers and the EVA suit worn by Matt Damon in the movie, The Martian. During a visit to the centre, students can take part in a number of space related workshops and missions, and explore six interactive galleries. Students can also experience their own journey into space, in the 360 degree virtual International Space Centre tour with Tim Peake himself. The spacesuit is currently on display at the National Museum Cardiff, as part of a free exhibition containing interactive displays about the International Space Station and life in space as a whole. The display is due to conclude on 10th February, after which it will move to the Ulster Folk and Transport Museum in Belfast, where it will be from 19th February to 12th May. Once the last leg of the tour has concluded, the Sokol spacesuit will go on long-term loan to the National Space Centre in Leicester. 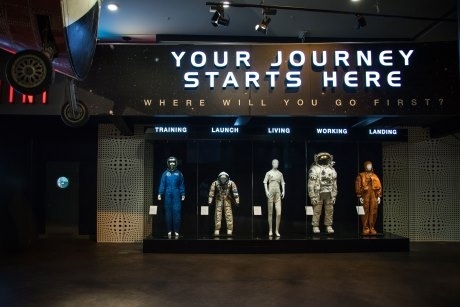 European Space Agency (ESA) astronaut, Tim Peake, said: “I’m really thrilled that the Science Museum Group has agreed that once the tour is finished my Sokol spacesuit will go on long-term loan to the National Space Centre in Leicester. The centre’s six galleries and 42m high Rocket Tower can be explored, and a Planetarium Show all about space is included in your visit. Gallery trails and workshop activities, suitable for Key Stage 1-4, can also be booked to enhance your trip. To make a booking, email bookings@spacecentre.co.uk or call 01162 582111. For more information, visit www.education.spacecentre.co.uk/programmes/school-visit.